The good news is that Brazilian pair Alisson and Bobby Firmino were on European soil; the latter opening the scoring for his side in a 3-1 win over the Czech Republic. And in a boost for us – not so much for his country – Mo Salah elected to stay behind on Merseyside rather than represent Egypt this past week. Sadio Mane was in Africa representing Senegal, and he scored a sublime winner for his side against Mali, setting off on an unstoppable solo run before slotting home. Happily, he only played the last 15 minutes as a sub, and despite being in Dakar he has plenty of time to get for Sunday’s game against Spurs. A number of other Liverpool players were in action, mostly in Europe thankfully, so issues of injury and jet-lag can hopefully be cast aside ahead of a potentially momentous weekend. Let’s not beat about the bush: the game with Tottenham is key to our title aspirations. It’s a hurdle to overcome, absolutely, but not a game that we should be treating with any trepidation with Tottenham showing certain vulnerabilities prior to the international break. Three points at Anfield will take us a step closer to getting our hands on the trophy. Speaking to the official club website, Klopp seemed to be in chipper mood with no major new injury doubts reported during the internationals. “Absolutely (it’s good to be back),” he said. “Now we are back, the boys are coming step by step back as well, so from Thursday on I think we will be complete. “With all players together, of course, the Dutch ones, the Brazilians, together in complete training. But preparation has started already. “We don’t have all the players who are away, but we have all the other players as well. Bringing players back, step by step. Okay, Shaq and Trent are still doing a bit of rehab, but the others are here and in good shape. Two sessions today (Wednesday) and then one session a day. Trent Alexander-Arnold missed out on England’s international games with a back injury, but the hope is that he will be fit enough to return on Sunday. Xherdan Shaqiri had a groin injury that prevented him from linking up with his Swiss teammates, but he too seems to be recovering well and will soon return to injury. There’s good news about Joe Gomez after his long-term injury; the defender is back in full training and working on his fitness, and Naby Keita will soon be ready to return to first team action too. 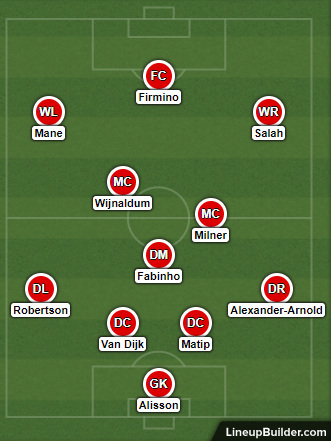 So, all in all, it was a decent international break for Klopp and Liverpool, and he will have pretty much a full squad to choose from on Sunday. You could make the case that the international break came at exactly the right time for Tottenham. They were reeling just prior to it with a formline of W0 D1 L3 in the Premier League, with three defeats in a row on the road at Burnley (1-2), Chelsea (0-2) and Southampton (1-2). With Eric Dier injured and Mousa Dembele sold in the winter transfer window, Mauricio Pochettino will have to do some shuffling of his pack here. It’s an unenviable job for the bookmakers this, pricing up a game between two high quality outfits on the back of an international break. But if this match was being played just prior to the break, then Liverpool would surely be the red-hot favourites given our brilliance on home soil and Tottenham’s fragility of late. Just take a look at the head-to-head records too: Liverpool have won eight of the last thirteen meetings between the sides, with four draws and a solitary defeat; that dark day when Harry Kane had Dejan Lovren on toast. And that confirms our suspicion: Tottenham struggle against sides who play football on the front foot and try to attack them. Knowing that we’ve come through the international break unscathed only goes to consolidate that idea, and so we are happy enough to take the 8/13 about a Reds win on Sunday.